Venezuela's president has said a consignment of Russian-made missiles with a 300km range will soon arrive in the country. Hugo Chavez said the missiles would be used in a purely defensive capacity. However, the imports come amidst tension between Venezuela and neighbouring Colombia over that country's decision to allow the US access to several military bases on its territory. ‘We have signed some agreements with Russia. 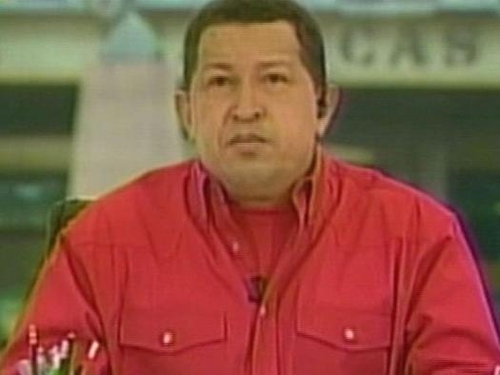 Soon we will begin receiving some missiles,’ Mr Chavez said during a meeting with supporters in front of the presidential palace. The president did not specify how many missiles would be delivered or whether the contract to buy them was signed during his recent visit to Russia. But, Russian President Dmitry Medvedev said Thursday that Russia would sell weapons to its ‘friend’ Venezuela. ‘These sorts of contracts are never signed in public,’ he said after meeting Mr Chavez at a Russian presidential residence outside Moscow. ‘We will supply Venezuela the weapons that Venezuela asks for. In accordance with all international law, of course,’ Mr Medvedev added. Responding to reports that Russia would sell tanks to the Latin American country, Mr Medvedev said: ‘Why not tanks?